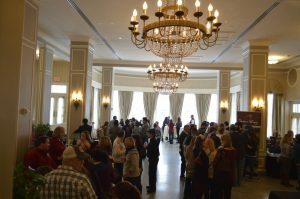 HSF’s annual Winter Wine Festival returns on February 23rd, offering the opportunity to taste and compare wines from distinct regions of Virginia. Providing generous access to vendors, the event features a select group of wine and cider producers from both sides of the Blue Ridge Mountains in the comfort of the historic Stonewall Jackson Hotel. Tickets may be purchased for $30 in the lobby of the Stonewall Jackson Hotel during the festival. All ticket purchases include tastings, a souvenir glass, and a snack bag. NO OUTSIDE FOOD IS PERMITTED. A snack bag is included in the price of the ticket, and additional food is available for purchase in the concession area. Designated drivers and non-drinkers are welcome and are not required to purchase a ticket. This is a snow or shine event, and tickets are non-refundable. Proceeds from this event help Historic Staunton Foundation fulfill its mission of providing leadership, education and advocacy to help preserve our historic community. Interested in extending your visit to Staunton? The Stonewall Jackson Hotel has a package offer especially for Winter Wine Festival attendees. Please visit their website for details.